On request, here is a quick example of how the colors can be changed in the new This is me template. To make the color switch easy to revert, I will do it using a custom class on the body element in the HTML. This will allow you to apply styles using CSS that will only be active if the body class is included, which means that you can test different styles without having to edit the default CSS. And by removing the body class, you can easily get the default design back. Since I do not want to change the font, I will not include it in the new inverted styles. Only the properties that should be changed, needs to be included. The rest will follow the default styles. I have written about body classes before, as a useful tool when modifying website template designs. This is another example of how to use such a class, but as can be seen in the screenshot above, the new background color doesn’t go very well with the menu icons so the colors used in this example may not be optimal for you. If you still want to use a light-on-dark version of the “This is me” template, the next tutorial will come in handy: I’ll explain how to replace the menu icons with new images, so that you will not be limited by the few icons that are included in the template package. 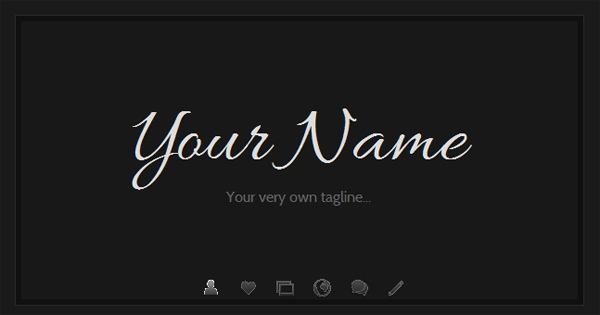 I’m new in this things and I would like to now in “this is me dark” template how can I visualise the images while I’m working in dreamweaver. I can only visualise the home page. Hi, thanks for the great templates! Can you please tell me if there is any way to add a scroll bar to the bio and custom pages? I would like to incorporate a significant amount of text. Thanks. this is trully awesome design template vcard… very clean.. thanks for sharing.. love it.